Congraulations on getting an heir to your gene-seed! May he grow strong! Models look good, glad to see your army expanding. I'm not sure what kind of light are you using, but black color turns out greenish on my screen. I'm just using a standard house lamp. I'm not certain how to fix that as it all looks black on my end. Imo it looks good the way it is. You just nees to paint all the details and do some edge highlights so it doesn't look like mostly unpainted. Having the model based makes a big difference too. About the poaches, no clue why you don't like painting it as leather and I feel like it's a reason I'm not particularly interested in hearing, but I don't really see something else than black or brown working for it. As per your signature, you've alerted us to the fact you sometimes make these language nuance mistakes and come off as more abrasive than you intend to - so that's understood. But I its also my duty as a mod to point out that this is a prime example of one of those moments, so you can learn. Please try to avoid phrases like this in the future. Comments like these don't facilitate a supportive and collegial forum environment, and they go too far a way in making you look like more of a nob than you actually are. Aye, I can see how that phrase is misleading. It sounded a lot less abrasive in my head. Thanks for telling me though! Annoyingly I was thinking about removing said disclaimer since it was going well lately. I guess it'll stay for a bit longer. The curse of germanic languages aye? On topic: good looking models there! Nice how the scouts turned out, and congratulations on becoming a dad! RIP your sleep i guess? Edited by Lynnean, 15 April 2019 - 04:26 PM. Your Scouts and Assault Marines are well-painted. I've had a productive week. It's a wonder what happens when you don't have to go to work! 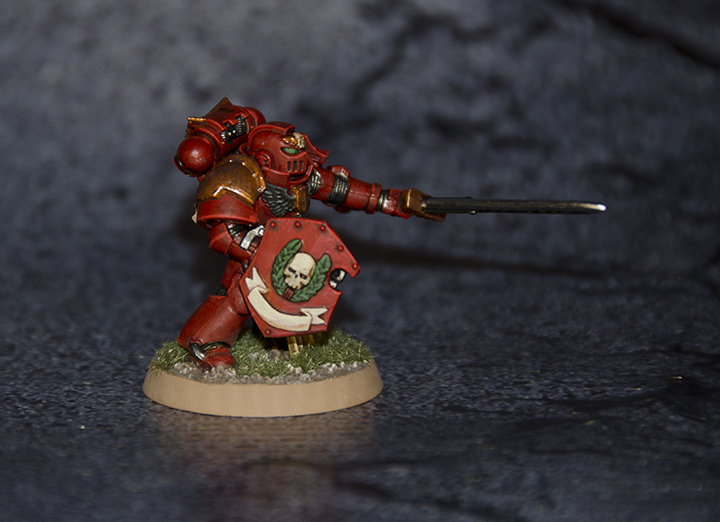 My Company Champion is finished, aside from the matte coat as I've run out for the time being. I tried a different light setup, though there's not a whole lot of black to worry about. 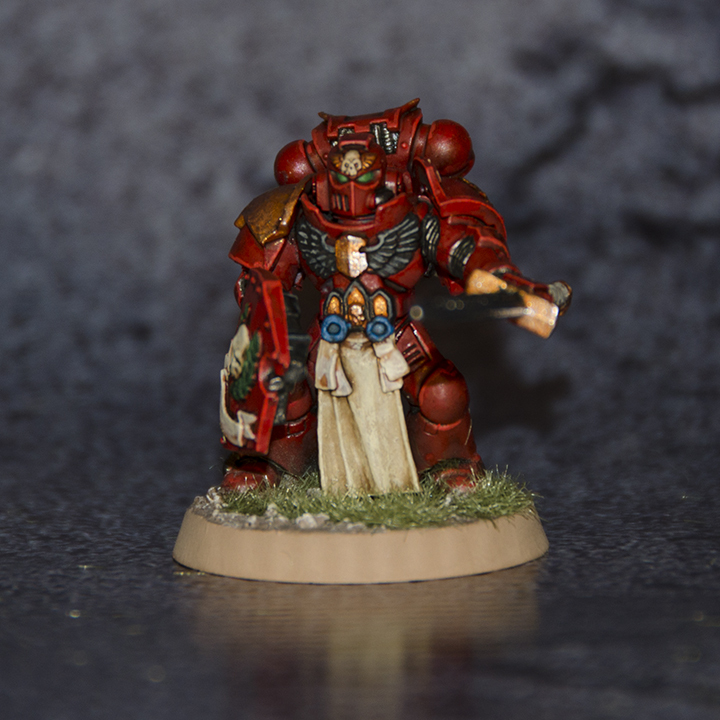 The result is certainly quite a bit darker, the model is the same red as everything else though, I promise. As an aside, maybe I'll stop taking such close-up photos. They certainly don't hide any imperfections. I really like the dark red and the bright edges. It's nice and warm and goes great with that gold shoulder pad. I like the close-ups myself and can't find any of those imperfections you're talking about. The Champion is well done.